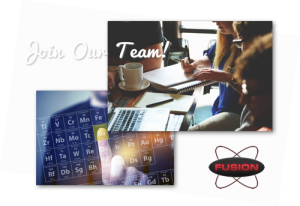 Career Opportunities | Fusion Inc.
Fusion Incorporated is a company with a long and proud history. At Fusion Incorporated our employees are our greatest resource and the key to our continued success. Join a team of talented and dedicated employees that strive to achieve the company goals every day. Focused on regulatory compliance and product development activities. This role supports the business objectives and provides customer support by maintaining the safety data sheet library, coordinating appropriate testing to ensure product compliance, recommending proper shipping and transportation requirements, and supporting other technical development activities as required. To process raw materials into finished powder by melting, atomizing and screening the alloy to meet specification, for use in the manufacturing of brazing and soldering paste. Responsible to develop and direct the sales and advertising organization in the domestic sale of brazing and soldering paste and equipment in the company’s market areas. Formulate and recommend sales and marketing policies and programs to maintain and improve competitive position and profitability of operations. Direct and manage the regional and district field staff and programs related to the sale of pastes, applicators and automatic brazing and soldering systems. Manage customer service and other sales service functions. Act as liaison between the customer and various sales service and product related functions. Establish exceptional customer relations and ensure complete customer satisfaction. Drive increased regional sales income via Manufacturers Representatives or Fusion Sales Engineers. Apply via email to resumes@fusion-inc.com. In the Subject Line of your email, please provide the name of the position for which you are applying. Attach your resume along with a cover letter and salary history.